'Is this the real life? Is this just fantasy?' is lit up in large neon lights over Carnaby Street in celebration of the new film, Bohemian Rhapsody, telling the untold true story of British rock band Queen. 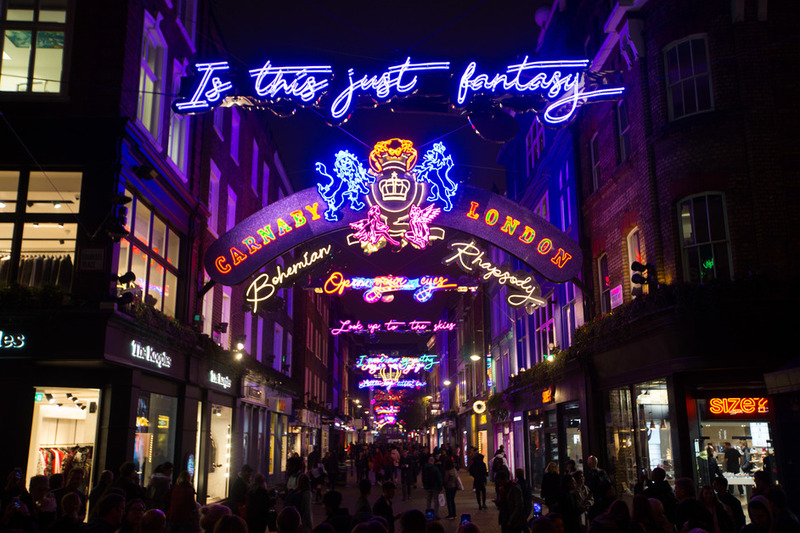 Freddie Mercury's famous lyrics shine bright over Carnaby Street while further along there's the playful 'Galileo' and 'Figaro' - sure to get you humming Queen songs as you stroll down the street. As well as the Bohemian Rhapsody Light Installation there's a pop up shop and exhibition at 3 Carnaby Street (until early January) where you can buy merchandise and immerse yourself into the world of Queen with a showcase of photographs, prints, footage and costumes plus they're getting in the official Freddie Mercury figure from Madame Tussauds. Plan the perfect year in the capital with our pick of the best events in London 2018. From January to December, every month boasts an impressive line-up of entertainment. So take a look at our guide and be sure not to miss a thing. What are the best dining options near Bohemian Rhapsody Light Installation London? Bohemian Rhapsody Light Installation gyms, sporting activities, health & beauty and fitness. The best pubs near London Bohemian Rhapsody Light Installation. Bohemian Rhapsody Light Installation clubs, bars, cabaret nights, casinos and interesting nightlife. Where to have your meeting, conference, exhibition, private dining or training course near Bohemian Rhapsody Light Installation. From cheap budget places to stay to luxury 5 star hotels see our deals for Carnaby Street hotels, including The Courthouse Hotel from 93% off.